Walking into Hove from Brighton along Western road takes you past an endless row of appealing looking restaurants, cafes and bars of all varieties under the sun. 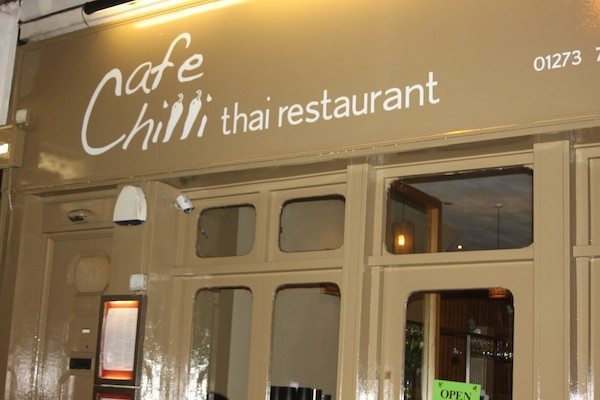 Greek, Lebanese, Italian and Chinese eateries all make an appearance until, just as Western road turns into Church road, quietly sits our destination for the evening: a restaurant with a modest exterior painted a gentle green, with an elegant scrawl reading Café chilli. Bigger inside than it looks from the pavement, small tables arranged neatly stretch far back into the room, patiently awaiting the night’s custom. We nestled in by the large window at a cosy table for two. 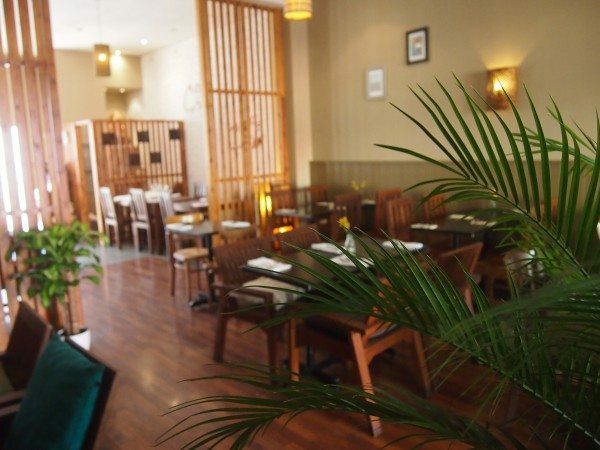 The restaurant immediately felt like a charming and romantic spot, unpretentious and welcoming. The furnishings were minimal but elegant, with tasteful lanterns giving the place a warm glow. Everything on the menu sounded unbelievably tempting and it was clear from a first glance that this was extremely authentic Thai food. Luckily I had my boyfriend with me, who had travelled in the country and was getting waves of nostalgia for sun and spice, to confirm it. The options were split into main sections of curries, stir fry plates, noodle dishes and extensive fish options. We ordered a glass of wine each to accompany our extensive study of everything on offer. The Thai market drinks of pineapple, mango or other fruity shakes looked very tasty from what I could tell from peering at a neighbouring table. 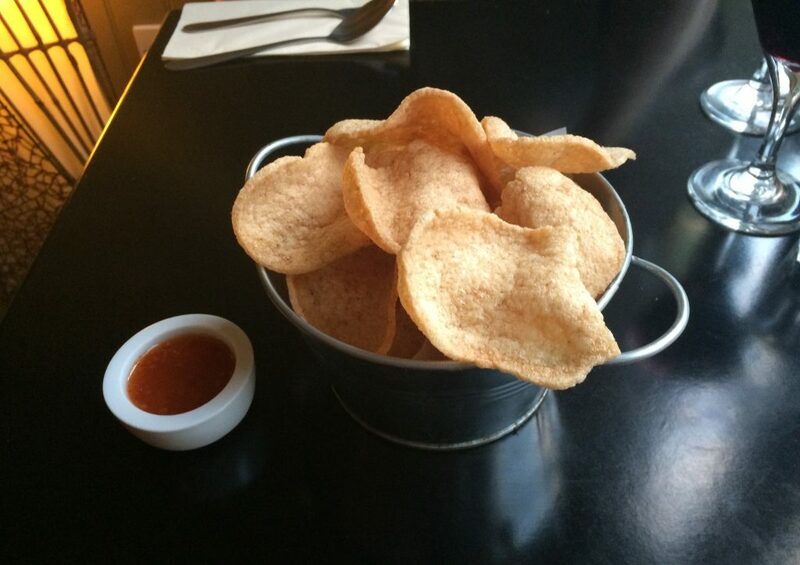 We chose our starters and nibbled from a big metallic bucket full of crunchy thai prawn crackers, which were herby and moreish, dipped in a sharp and spicy sweet chilli sauce. We had decided upon two seafood dishes to start, which arrived simultaneously at our table, carefully presented. From the menu we went for the golden crab- a delicate soft shell crab, lightly battered a golden brown and scattered with nuts. Bathed in a gentle and garlicky sauce, it had a mild but intriguing taste overall. I had never tried a soft shell crab before and the texture surprised me. Our second shared starter was selected from the specials on offer that night and after the first mouthful I realised why, when we had made our order, the owner Seb had smiled and told us it was a great choice. 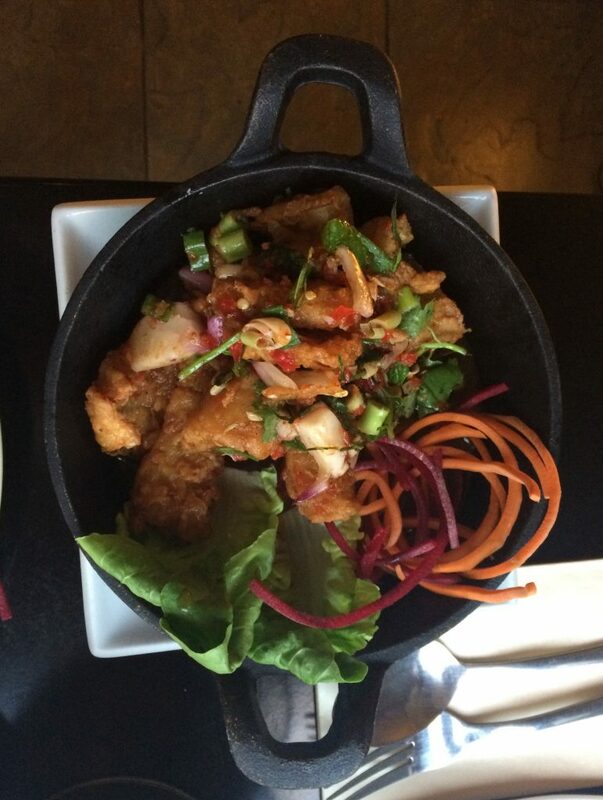 The crispy calamari salad dish was undoubtedly one of the highlights of the meal. Tender and battered, the squid came covered in a dressing that hit you powerfully with its strong flavours. 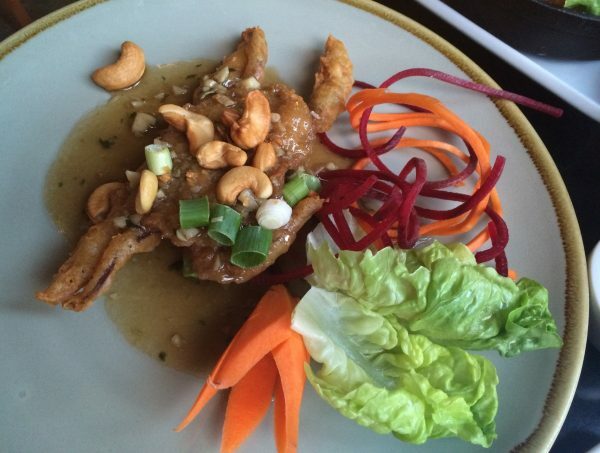 It was spicy, with a bold lemongrass taste, mixed with kaffir lime leaves and Thai herbs into a distinctive combination. 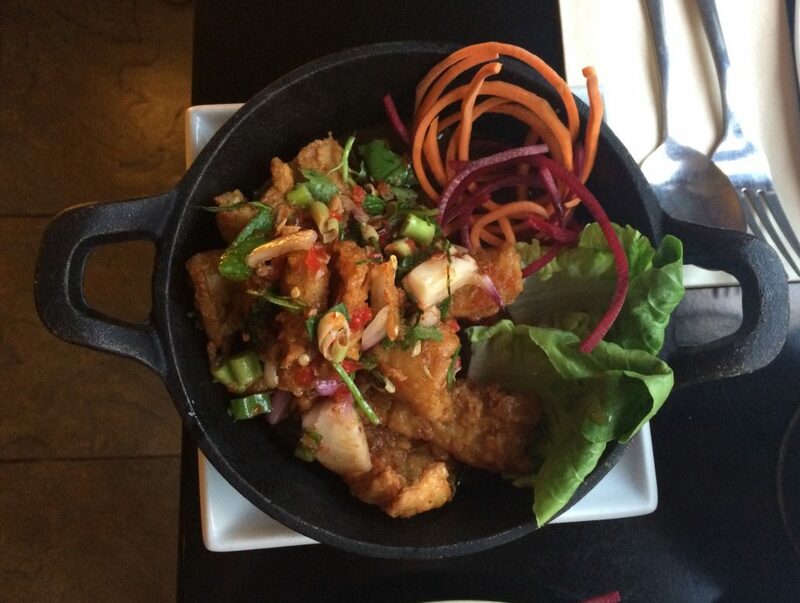 It was an example, Seb informed us, of yum- a Thai salad that can be made from fish, pork, beef- or any main ingredient. We were both as impressed with his fluent Thai, which he told us he had first learned when teaching English in a small village, as we were with his evident passion for the country and the fascinating myriad of flavours in its cuisine. By the time we had paused to digest our starters, the restaurant had got busier and a gentle buzz of conversation filled the room. I liked how it managed to achieve the secluded and intimate feel of an up market restaurant while still remaining relaxed and casual. Even after such exciting starters, the main dishes did not disappoint. The ‘dancing beef’ I ordered came on a sizzling hot plate. Slithers of beef were stir fried with garlic, chilli and a sweet and delicate basil, all accompanied with- but not smothered in- a rich and sweet tamarind sauce. The sauce complemented the meat and vegetables without overpowering it. Someone braver than me might have also devoured the big chunky chillies mixed in, but I left them to for the rest of the food to soak up. 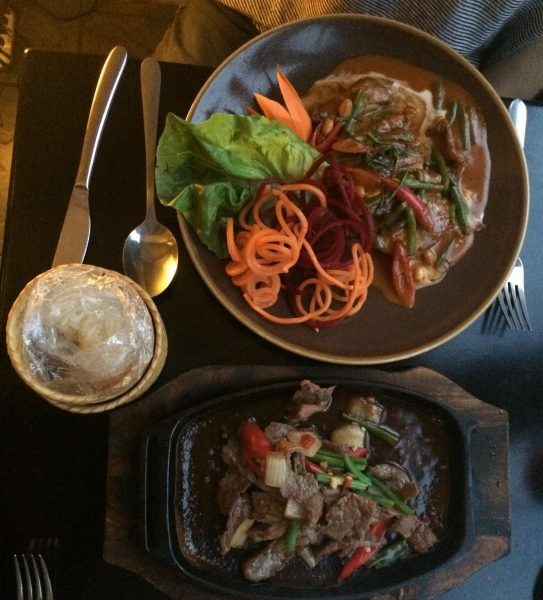 My boyfriend chose the siam duck, which was another real standout dish. 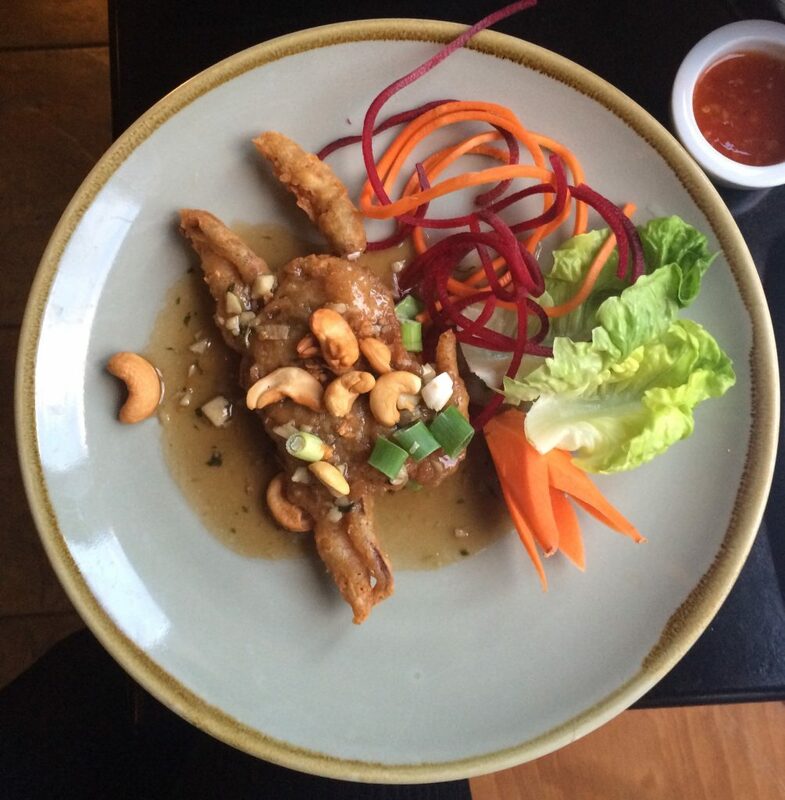 The duck pieces, with a crisped layer on one side, came in a peanut and coconut sauce which was perfectly spicy with strong, bold flavours. he couldn’t order one quickly enough. The coconut sticky rice came with fresh mango slices, coconut milk and some sesame seeds on top. 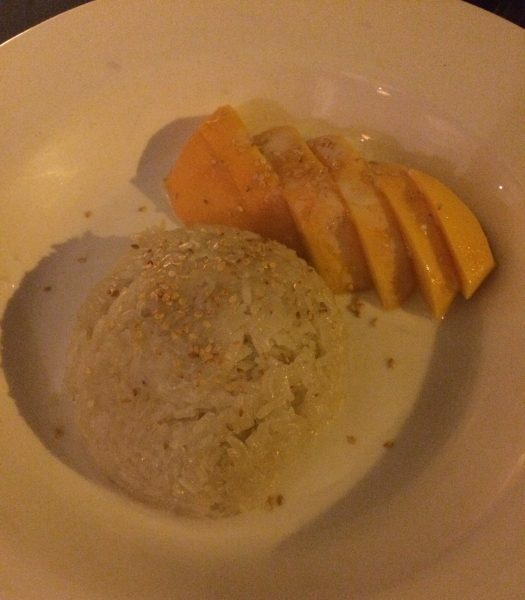 Expecting something more like rice pudding, it was far drier than I had anticipated, but wonderfully sweet. Despite it being so heavy and rich, we wolfed it down. a memorable meal and a highly recommended destination. Both being fans of Thai food anyway, we loved the meal, but the exciting complexities to the dishes and the attention paid to detail evident in every mouthful made it a memorable meal and a highly recommended destination.